Founded in 1881 in the village of La Chaux-de-Fonds, Movado have been creating stylistically impressive and technologically innovative Swiss-made watches for over 135 years. Featuring an iconic single dot in the 12 o’clock position, Movado timepieces are on display now in a plethora of models that range from streamlined and understated, to pieces, like those of the Movado Bold collection, which are chic, glamorous, and fashion-forward. Designed with the philosophy of “modern ahead of its time,” available in models for ladies and men, the Swiss timepieces of Movado make wonderful gifts for watch enthusiasts of all ages and are proudly on display today at Albert’s Diamond Jewelers – an esteemed Movado retailer. For over 111 years, Albert’s Diamond Jewelers has dedicated themselves to being the premier source for the best in modern watch design, and are thrilled to extend the legendary timepieces of Movado to their Chicago area customers. 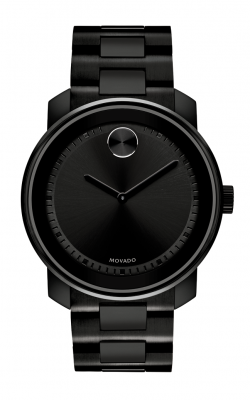 Firstly, from Movado’s flagship line come the understated watches of the exclusive Heritage Calendoplan collection. Made with gold-plated stainless steel cases and genuine leather straps, the timepieces of the Heritage Calendoplan collection combine useful chronographs, date subdials, and accurate moonphase complications to create watches that are truly more than the sum of their parts. In addition to these wonderful pieces, the models of the Movado Series 800 collection are easy-to-read pilot watches of exceptional vintage-inspired charm and style. Also available today, in the Schererville and Merrillville showrooms of Albert’s Diamond Jewelers, are even more exceptional timepieces from the Swiss-based master watchmakers of Movado. 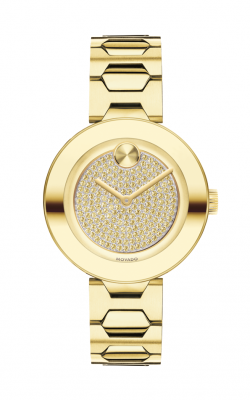 Extremely popular amongst today’s most stylish women, the watches of the Movado Bold collection are widely-appreciated for their big and bright yellow gold, rose gold, and silver-colored faces. Deceptively simple, the timepieces of the Bold collection by Movado offer wearer’s a dash of high-fashion sparkle that looks positively spectacular when worn with casual or formal wear. Finally, a perfect example of Movado’s commitment to horological innovation, the men’s timepieces of the Edge collection feature an unforgettable modernly-designed face, comfortable rubber strap, and water resistance up to 100 feet. Family-owned and operated since 1905, Albert’s Diamond Jewelers is proudly Chicagoland’s first choice for an amazing selection of designer-made engagement rings, wedding bands, fashion jewelry, loose diamonds, and Swiss-made timepieces like those from Movado. With two fabulous showrooms located in Schererville and Merrillville, Indiana, the experienced staff at Albert’s Diamond Jewelers is more than ready to help their customers with finding the perfect fine jewelry item for any occasion. Additionally, to ensure the long life of every purchase made, Albert’s Diamond Jewelers also extends on-site jewelry and timepiece repair, comprehensive customization services, as well as financing available with approved credit.